Here’s a music video some friends and I put together for fun (you can download the mp3 below). This project was originally featured on the Tyee. Click here for annotated lyrics with links to articles explaining Ezra Levant’s history as a tobacco lobbyist, plus the connections between Sun News, the Conservative government, and so-called “grassroots group” Ethical Oil. Bonus article from Andrew Nikiforuk on the takeover by Chinese state-owned companies of strategic Canadian energy resources. Shoutouts to my dear friends Caitlin Dodd, David Henderson-Hean and Spencer Powell for their hard work. Plus Nikolina Suric, for giving us the men’s suit from this other video. 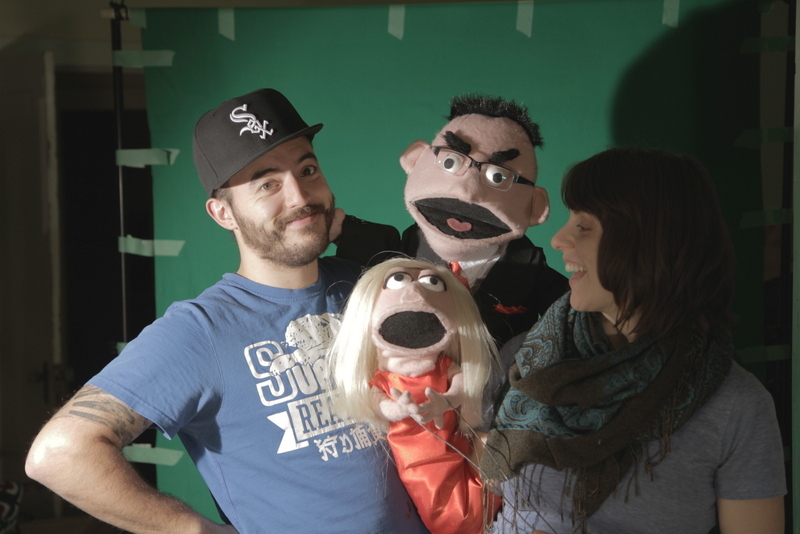 And the fellows at Point Blank Creative for the use of their lights and greenscreen. And my grandma, for letting us come over and use her sewing machine. That fine hip hop track you hear is the work of Emile Scott. We call it “Pipe Dreamz, feat: K-Mart & Easy-E”. If you’d like a copy, by all means enjoy a free mp3 download. Right-click to save the link. If for some nerdy reason you’d like a ringtone, why, here’s an m4a version or here’s an mp3. Enjoy the dulcet tones of a plush tar sands apologist with every incoming call! Everyone worked on this for free and we were happy to do it. That said, if you enjoy the song, we’d be grateful if you could toss a few coins in the jukebox. (There’s a PayPal link in the sidebar of this blog. It’s yellow and says “Make a Donation”.) We’ve also got a script written for a follow-up, set at 24 Sussex. If you can help us cover the costs of the pink felt, styrofoam balls and fun fur, I’ll start working on my Calgary French accent. Our little family has some big mouths to feed. Behind OIL today are money and social manipulations with their key driving forces: greed, unrestrained consumerism and selfishness. Opposing/questioning it by only one notion “Ethical” (even if taking into account its complexity) is not enough. It is a very difficult task today to oppose even the smallest things that are wrong when people are engaged/focused in/on their never ending run for more money that secures their the most cherished motto: “right for happiness”. Behind this phrase many different things with the lowest human ethical values can be placed what allows easy control/manipulations of our societies. This ‘progress’/’evolution’ is accelerating when our religions, family values and bonds, social sensitivity, honesty etc. are so quickly eroded in this globalizing corporate world controlled by a greedy and arrogant Center Of 1% (CO1%) with their Big Money. Bravo, saw the video on the Tyee. You may want to watch the encore presentation of a recent ‘interview’ with Ezra Levant on Shaw 4’s “Studio 4 Fanny Kiefer” in Vancouver on Thursday, March 22nd. You win a prize if you can watch the full interview. The prize you ask? Your sanity. This guy, Ezra, takes the prize for making up stats and facts on the spot, none of them of course can be validated and appear to be purely a figment of his imagination. Ezra appears to have a very active imagination coupled with his own belief structure which at times during the interview can only be described as delusional. I could not watch the full interview as it required an ongoing suspension of the truth. The Mythbusters could devote a whole season of programming to Ezra alone. I thought the Ezra puppet was spot on. Harper’s not crazy. Crazy is just the front for corporate interests. Harper’s Neoconservatism: This entire “hard right” movement is a crock. It is not a religious evangelist movement, **OR a moral movement. It is a corporate movement. Uncannily accurate characterization of Katherine Marshall. Can’t say about Ezra, as I have avoided him, knowing my head would explode if I had to listen to anything he says. And I love the scary ending. But, Kai, what about the Tides funding, how much of that did you get? haha. @Nadine, ‘pushedleft’ as a name is pretty much bang on. I love that as well.